On December 1, 1955 Rosa Parks was arrested in Montgomery, Alabama after refusing to give up her seat to a white man while riding on a segregated bus. Rosa Parks’ courageous act drew national attention to simple truths: A public transit system paid for by all must benefit all, and civil rights must be protected for all. 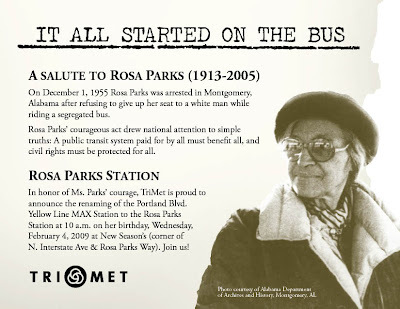 In honor of Ms. Parks’ courage, TriMet is proud to announce the renaming of the Portland Blvd Yellow Line MAX Station to the Rosa Parks Station at 10am on her birthday, Wednesday February 4th, 2009 at New Seasons (corner of N. Interstate Ave & Rosa Parks Way). Join us! This entry was posted in Transportation and tagged MAX, Rosa Parks, Trimet by Noah Brimhall. Bookmark the permalink. >We should have had Rosa Parks Transit Mall dedicated downtown.